The eponymous debut from Shawn Maxwell’s Alliance was a giant step forward for the saxophonist/composer; his previous albums all had musical merit, but all were built with limited color schemes, hewing, for the most part, to jazz norms. 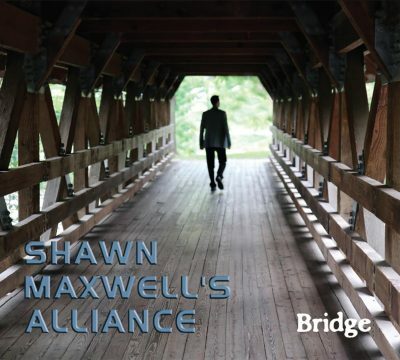 With Shawn Maxwell’s Alliance (Chicago Sessions, 2014), Maxwell stepped way outside the box, writing music for a dectet that was anything but formulaic or commonplace. Now, less than a year later, Shawn Maxwell’s Alliance returns with the shorter, but no less intriguing, Bridge. This five song outing finds Maxwell and company exploring a variety of avenues. The title track is initially constructed in fugal fashion and features instrumental sections—not individuals—trading solos in feisty fashion; “Monster Shoes” is grounded by a somewhat ominous riff that’s first introduced by bass and french horn, but the meat of the song is the guitar solo from Mitch Corso; “Ava” is a texture-focused painting that gently floats along, giving vibraphonist Stephen Lynerd and Maxwell a chance to shine; and “Sector 7-G,” named, no doubt, for Homer Simpson’s work area in the Springfield Nuclear Power Plant, finds Maxwell’s flute and Lynerd’s vibraphone gliding and bounding atop drummer Paul Townsend’s Latin-tinged groove(s). The final number on the album—the brief “Plan Z”—is somewhat out of place, as Maxwell leaves the ensemble behind and builds an overdubbed saxophone ensemble, yet it still speaks to the tactics used with the larger group. Maxwell layers idea on top of idea here, building a piece of musical machinery one cog at a time. Then the ensemble moves as one, supports exploratory ideas given forth from above, creates a disorienting yet unified sonic front, and walks right out of the picture together. It’s a fine way to close out a brief album full of rich musical ideas, colorful passages, and unique musical constructs. Track Listing: Bridge; Monster Shoes; Ava; Sector 7-G; Plan Z. Personnel: Shawn Maxwell: alto saxophone, flute; Casey Fitzpatrick: soprano saxophone; Keri Johnsrud: voice; Stephen Lynerd: vibraphone; Mitch Corso: guitar; Rachel Maxwell: french horn; Meghan Fulton: french horn; Stacy McMichael: bass; Marc Piane: bass; Paul Townsend: drums.